Even the greatest of painters can be plagued by mundane problems. 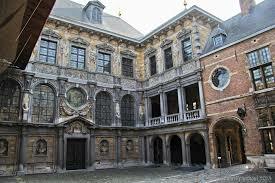 In this case, Rubens had problems with a botched job on his roof in 1615. While making discoveries in the Antwerp archives about errant panel makers (which we will publish in due course) JVDPPP archival research fellow Ingrid Moortgat unexpectedly unearthed a formal legal deposition made by Rubens in 1621. 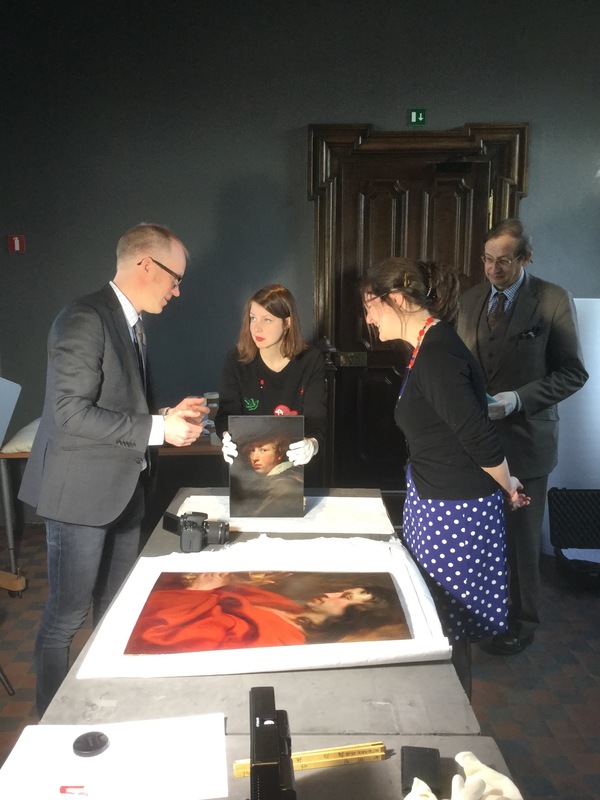 We have passed it on to our colleagues at the Rubenshuis, Hannelore Magnus and Katrijn van Braght for their research. They are pictured below with Van Dyck’s self-portrait from this same period. The young Antonio and Jacques knew the Rubenshuis well as they both worked there for Rubens around this time. This is the timeless tale, translated from 17th century Flemish legalese. ‘Today the fifth day of the month of January in the year of our Lord one thousand six hundred and twenty one. At the request of Abraham van den Bossche, slater, appeared before me Peeter Van Aerdenbodeghem, notary public residing in Antwerp, in the presence of witnesses mentioned below, the honourable gentleman Peeter Paulo Rubens painter to Her Serene Highness and he has declared and certified, declaring and certifying hereby to be true that he declarant, among other things, asked his joiners who made his house in the year 1615 also to make the attic and, at the same time, his roof which he had them cover with slates. Also he declared to be true that in this way it was tiled with this same covering by the above-mentioned joiners. How to cite: Davies, Justin. “The Botched Job on Rubens’ Roof” In Jordaens Van Dyck Panel Paintings Project.